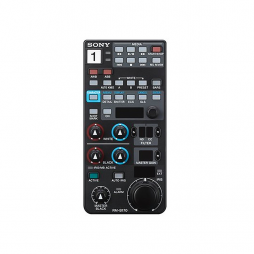 The RM-B170 remote control unit provides an affordable solution for remote operation of Sony cameras. It can be connected directly to a camera as a portable remote control unit or it can be connected to a CCU as a simple remote control panel. The RM-B170 offers camera control from a distance of up to 100m (328 feet) with a direct connection to the camera. This unit is perfect for use with our PMW 300’s when placed in a hard to reach or inoperable area.